↑ "California Department of Fish and Game, Marine Region: El Niño Information". （原先內容喺2007年6月21號歸檔）. 喺2015年11月8號搵到. 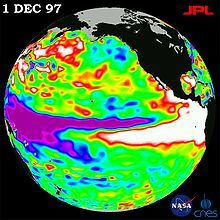 ↑ "There Goes El Nino, Here Comes La Nina". The Associated Press / CBS News. 2007年2月28號. 喺2007年3月23號搵到.